I thought I would try something a little different here and do a comparison review of 2 products that I’ve come across of late. Why would I do such a thing? Simple – if I have a chance to grace the heathens of this world with my beautiful and borderline lyrical prose AND give a little guidance at the same time, then why the hell wouldn’t I? Yeah… got no smarty comebacks for me now, do ya chief? Wait… where the hell was I? Oh yes… a review. I call this a “Review Without Influence” because I have no outside vested interest in the outcome of this product comparison. No one is paying me to do this and I wasn’t sent anything for free. Given that my day job involves ethics in the corporate setting, I am a pretty huge believer in full disclosure. If I ever get to the point where someone does send me something free and I write about it, y’all will know it. Ahh, for the chance to live in such heady times! So today’s Review Without Influence is a comparison of two products that are intended to bring some convenience to the increasingly popular Paleo Diet. 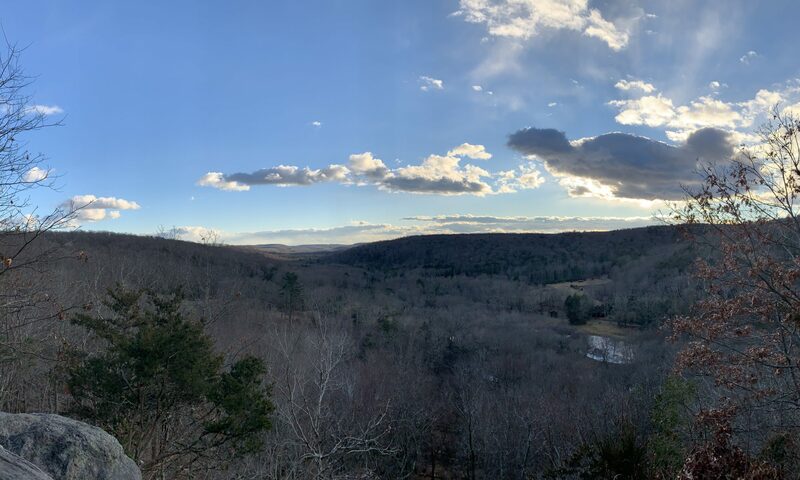 While I could spend an inordinate amount of time describing the diet, I will break it down to its barest fundamentals: If cavemen ate it, get on it. If not, let it pass.The poor cavemen never had the convenience of Internet shopping and shrink-wrapped snack deliciousness, though… so I feel kind of bad for them. Fortunately for us, that’s not an issue. Please note I find it amusing that while typing up this post, I was eating buffalo (Paleo! ), but with black beans, cheese and a beer (none of which are Paleo in the slightest). 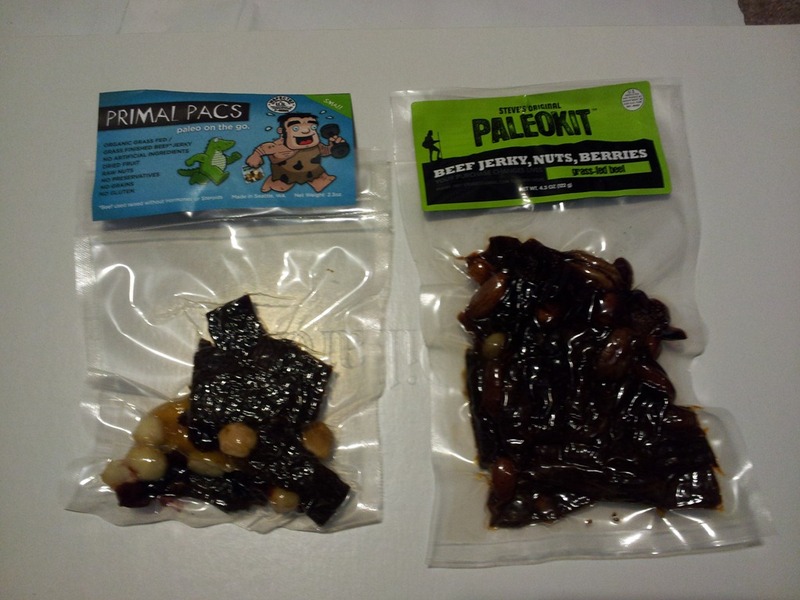 The two products are Primal Pacs and PaleoKits by Steve’s Original. In making this comparison, I tried to find the most comparable sizes of products, which if you look at the photo above may make it seem like I did a lousy job in accomplishing this task. I can see why you would think that, but the funny thing was that the Primal Pac small and the PaleoKit large were actually the closest in terms of content/nutritional breakdown. Enough dawdling. Let the prehistoric comparison commence! I tried the PaleoKits first because they shipped a bit quicker. The packaging is of sturdy construction such that you aren’t going to worry about the plastic tearing or puncturing if you have it in your bag while on-the-go. I ordered the grass-fed beef jerky, nuts and berries combo which is comprised of grass-fed beef jerky, cranberries, strawberries, almonds, pecans and macadamia nuts (although I must confess, not enough of the mac nuts for my liking). All of the nutritional info you can find above. If you skip ahead to look at the same info for the Primal Pacs, it makes for an interesting comparison. While the large PaleoKit has slightly more protein and slightly less fat, it has a much larger overall size for the package (122g vs. 56g in the Primal Pac). There are more carbohydrates in the PaleoKit, but given that I am not a low-carb zealot, it doesn’t bother me at all… but it does look like the carbs make up the bulk of the difference in the total content of the two products. And speaking of that, let’s get to taste. PaleoKits are… in a word… tasty. They do a nice job of giving you both sweet and salty (a combination I’ve long enjoyed). Of the two products, this is the saltier without a doubt (just check the sodium content if you don’t believe me). The beef jerky is flavorful and not overly tough/chewy. I think this is due, at least in part, to the amount of liquid/juices in the packaging. It’s not moist like a filet mignon or juicy burger, but it’s actually nice to have something to chew on that isn’t akin to rawhide leather. I would definitely advise that if you want to eat these on-the-go (which is probably why you would buy them in the first place), pack napkins. You will definitely have seriously sticky fingers otherwise from the fruit juices in the package. It’s not a major hassle, but it’s something to keep in mind. On a completely unrelated note, it’s kind of cool to see that 15% of the profits from PaleoKits go to a 501(c)(3) charity for kids. I will leave it up to you to make your own choices on the fact that the charity is to get at-risk kids involved in Crossfit. But giving back to something that matters to the owners? Always a thumbs up from me. 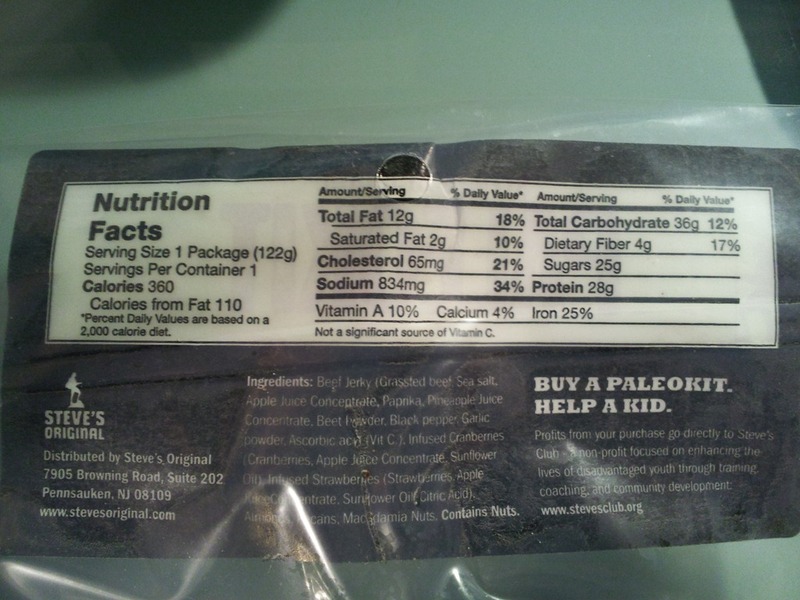 Pricing: The cost for the 5 Grass-fed PaleoKits (size large) was $32.50 plus $9.39 in shipping, at a total of $41.89. Working out to $8.38 per pack, that’s a bit pricey in my mind. You do certainly get the convenience factor for a very healthy snack with grass-fed beef you can eat anytime – 100% agreement. Just need to think over whether that’s worth quite that much. Primal Pacs were the second Paleo snack product I had the chance to try and I snacked on these today. Fairly similar packaging to the PaleoKit and they seemed like they could withstand being knocked around wherever you had to take them (camping, hiking, gym bag, carry-on at the airport, etc.) For the Primal Pac, I looked for the most comparable product and since everything is grass-fed/grass-finished beef, it made it easy. The ingredients here were grass-fed jerky, mango, macadamia nuts, almonds, cranberries and a variety of spices and seasonings. 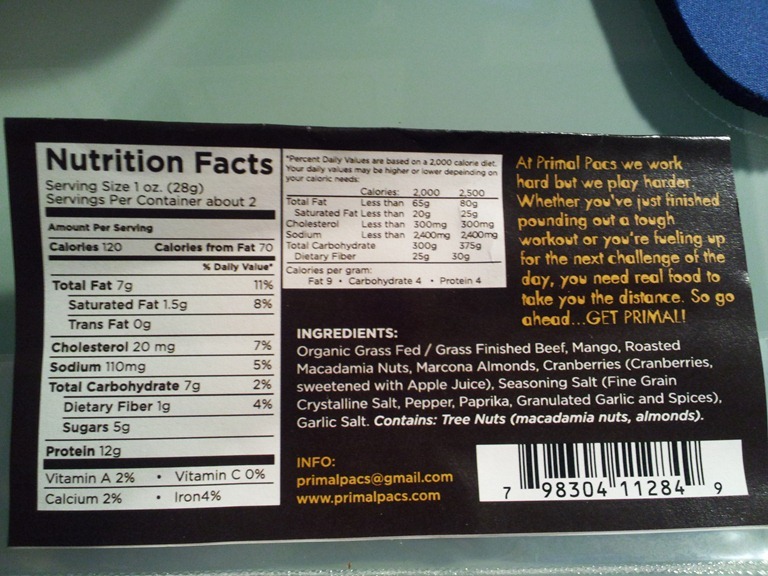 In looking at the nutritional info, eating a full package of the small Primal Pac gets you close to the PaleoKit on protein and fats, but is definitely off on the carbohydrate side. You can even just tell looking at the side-by-side shot of the two packages that there is a big volume difference, but in eating them, I did not notice a huge difference in feeling more or less full with one or the other. That’s actually one thing similar between the two: I did not feel all that full in eating them, but truthfully, that was perfect. I feel satisfied and really nicely energize on both – these are not the kind of snacks you knock back, get an energy rush and then want to take a nap from 60 minutes later. They both seemed to do a nice job of keeping me going through my work day (which is likely when I would be using them in addition to airport snacking). Also, these are definitely the lower carb option of the two products (if that is something you are concerned about). From a taste perspective, the Primal Pacs are also way tasty. The mango is a really nice twist to the overall flavoring and these are much less salty overall. Truth be told, I think I like the flavor of the Primal Pacs just a slight bit better than the PaleoKits. The taste and texture of the meat on both is very good, but the overall flavor combination of the beef, mangoes, cranberries and nuts with less juice and less salt made for an overall more pleasant taste experience. The ingredients get a chance to shine on their own without the salt winning out. Again, this is a subtle edge here to the Primal Pacs since I did enjoy both brands. Finally, the pricing on the small Primal Pacs was $17.50 for 5 and $5.00 for shipping for a total of $22.50. That works out to $4.50 per pack which is quite a bit less than the PaleoKits. It’s important to note that Primal Pacs and Steve’s Original do become cheaper on a per-pack basis when you purchase in greater quantities (which I will no doubt do going forward). I’m giving the edge to the Primal Pacs in this particular match-up of grass-fed beef/fruit/nut products. Their overall flavoring is a little better in my mind and the pricing difference is notable. I am curious to try some of the other Steve’s Original products since they have a very wide product line (which you can find here), so there may be other varieties which will grab my palate with a vengeance. But from a pure taste and value standpoint? I take my hat off to the fine Primal Pac folks – a nice product that I will be ordering some more of soon. I am hoping they will at least follow the lead of Steve’s Original in developing a wider range of product offerings as well. Either way, I think both of these would be great choices for any kind of traveling you may do. The kind of utter gahr-baaage you find in airports is not something a health-oriented person is going to lean towards, so these can be a real saving grace. I mean… unless that airport has some Chik-Fil-A. That stuff is flat-out magical… not healthy, but sweet mother of God is it tasty. But if you want tasty AND healthy, your friends at Steve’s Original or Primal Pacs can hook you up with a means to eat like a caveman wherever you travel… even if cavemen never flew coach from Boston to LA. At least that we know of. Those pterodactyls never looked very roomy if you ask me. If you enjoyed this, let me know or if you have ideas from some more product comparisons, I would be happy to do this again sometime (especially if it involves a lot of eating).